Obama: GM Has "Chance To Rise Again"
In a defining moment for American capitalism, President Barack Obama ushered General Motors Corp. into bankruptcy protection Monday and put the government behind the wheel of the company that once symbolized the nation's economic muscle. The fallen giant, the largest U.S. industrial company ever to enter bankruptcy, is shedding some 21,000 jobs and 2,600 dealers. Sparing few communities, the retrenchment amounts to one-third of its work force and 40 percent of its dealerships. "We are acting as reluctant shareholders because that is the only way to help GM succeed," Mr. Obama said of the temporary nationalization of the 100-year-old company. Obama lauded what he called a "viable, achievable plan that will give this iconic American company a chance to rise again" as GM followed Chrysler LLC into bankruptcy court. Of Detroit's "Big Three" automakers, only Ford Motor Corp. has avoided bankruptcy restructuring and has not taken federal bailout money. The prepackaged GM bankruptcy deal - crafted by the administration, the company, the United Auto Workers union and a group of bondholders - would give the U.S. government a 60 percent controlling stake in what was once the world's largest automaker. An additional 12.5 percent would be under Canadian government ownership. "What I have no interest in doing is running GM," Mr. Obama said. His only goal, he said, was to get GM back on its feet and then "to get out quickly." Yet, the U.S. could end up holding the shares for some time. Neither Mr. Obama nor his spokesman offered an indication of how long the government's involvement with GM would last. "I don't know that there is a timeline," said Robert Gibbs, the White House press secretary. "He has a strong obligation to ensure that there is a management structure in place that is making smart business decisions," Gibbs said. "Is the president going to thumb through engineering reports and each page of the annual report? No." A bankruptcy judge ruled late Monday that GM can have immediate access to $15 billion in government financing as it attempts to quickly restructure under court protection. Noting that time is of the essence, U.S. Judge Robert Gerber gave interim approval to the Detroit-based automaker's use of a total of $33.3 billion in financing, with the $15 billion available for use over the next three weeks. Gerber will rule on final approval of the total amount of financing on June 25. The judge also set GM's sale hearing for June 30, putting the automaker on a path similar to that of rival Chrysler LLC, which held its sale hearing about 30 days after filing for Chapter 11. Judge Arthur Gonzalez issued a ruling approving the sale of most of Chrysler's assets to a group led by Italy's Fiat Group SpA late Sunday and the company could emerge from court oversight soon. As it tries to reinvent itself, GM will unveil a new ad campaign this week, reports CBS News correspondent Anthony Mason. "This is not about going out of business," a new commercial says. "This is about getting down to business." But the new GM will be a shadow of its former self - the industrial giant that for much of the past century drove American prosperity. As GM goes, it was said, so goes the country. And for decades it was true, reports Mason. In the early 1960s GM made more than half of all the automobiles sold in this country. At its peak in 1979, the company was the country's largest employer with 600,000 workers. By next year, it will have just 60,000 employees in the U.S.
With the U.S. on track to be GM's new owner, the road ahead for the troubled automaker was an uncertain one - with a heavy potential for conflicts and many risks for taxpayers. "The agreement may buy some time, but does nothing to ensure GM's success," said House Republican Leader John Boehner of Ohio. "The only thing it makes clear is that the government is firmly in the business of running companies using taxpayer dollars." Longtime consumer advocate Ralph Nader, an early critic of General Motors, said on CNBC that the new arrangement may give GM a clean slate, but it also could become "a political boomerang for President Obama." Mr. Obama said he recognizes that even the temporary nationalization of GM "may give some Americans pause." But he called it preferable to letting the company fail outright - or giving it more and more bailout loans, money it has gone through rapidly. The administration will provide GM with an additional $30 billion in aid to help it restructure in addition to the $20 billion the auto maker had already borrowed from the Treasury. GM will also get $9.5 billion from Canada. If all goes according to plan, on top of the 60 percent U.S. stake and Canada's 12.5 percent, the UAW would get a 17.5 percent stake and bondholders would end up with the remaining 10 percent. Existing stockholders would be wiped out. Mr. Obama said the nation's severest economic crisis since the Great Depression had "crippled private capital markets and forced us to take steps in our financial system - and with our auto companies - that we would not have otherwise even considered." That has put the government "in the unwelcome position of owning large stakes in private companies." But he said "their survival and the success of our overall economy" depended on such aggressive action. It is one of the largest peacetime nationalizations. The government has taken shares in railways, steel mills, coal mines and foreclosed homes - but most of these came at times of war. The government did take over failed savings and loans in the 1980s and, more recently, mortgage giants Fannie Mae and Freddie Mac. In the current crisis, it has also taken significant stakes in banks and insurer American International Group. Most nationalizations have been temporary. But at least one has endured - Amtrak rail passenger service. Mr. Obama pledged that, despite its ownership stake, the government would not try to micromanage what is still one of the world's largest automakers despite its loss of market share to foreign competitors over the past two decades. 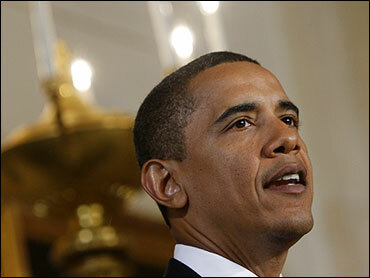 "GM will be run by a private board of directors and management team," Mr. Obama said. "They - and not the government - will call the shots and make the decisions about how to turn this company around. The federal government will refrain from exercising its rights as a shareholder in all but the most fundamental corporate decisions." "We're fine with that," Fritz Henderson, president and CEO of GM, told reporters in New York after the company filed for bankruptcy protection. Henderson said he hoped a leaner, quicker GM could emerge from bankruptcy protection in 60 to 90 days. The new GM would be formed "from the strongest parts of our business, including our best brands and products," said Henderson, who took over the top job with the approval of the Obama administration, which engineered the ouster of his predecessor, Rick Wagoner. Henderson declined to offer a firm timeline for how long it would take the government to sell its stake in GM, but he said: "This is a question of years, not months." GM plans to focus on four core brands - Chevrolet, Buick, Cadillac and GMC - and get rid of the Pontiac, Saturn, Hummer and Saab lines. The company's Chapter 11 bankruptcy protection filing came a day after a judge gave smaller rival Chrysler approval to sell most of its assets to Italy's Fiat. That moved Chrysler closer to exiting from court protection, possibly later this week, Obama noted. "Many experts said that a quick, surgical bankruptcy was impossible: They were wrong," Mr. Obama said. GM plans to permanently close nine more plants and idle three others to trim production and labor costs. Six of the plants are in GM's home state of Michigan, already hard-hit by job cuts in the auto industry. GM's assembly plant in Wilmington, Del., will close in July, followed by its Pontiac, Mich., pickup truck plant in October. Assembly plants in Spring Hill, Tenn., and Orion, Mich., will end production this fall but remain on "standby," meaning workers can be called back should the company need to increase production. One of those plants would be retooled to produce a subcompact vehicle that GM had originally planned to build in China. The closings will bring GM's U.S. factory count to 34 by the end of 2010, down from 47 at the end of 2008. The company will shutter an additional plant by the end of 2012. GM's bankruptcy filing came amid some signs of economic improvement. The Dow Jones index closed up more over 200 points as investors looked past GM's woes to better-than-expected readings on U.S. manufacturing, consumer spending and construction spending. In a painful twist, the Dow's rise came as GM itself was in the process of being removed from the roster of 30 Dow stocks - to be replaced next week by Cisco Systems Inc. - as a consequence of its bankruptcy filing. Top executives from General Motors and Chrysler will appear before a Senate committee Wednesday to address concerns about dealership closings as the two automakers work through government-led bankruptcies. Mr. Obama predicted that a new well-managed GM would emerge able to "out-compete automakers around the world." And, paraphrasing an oft-quoted line in 1953 by then GM chief Charles Wilson, Mr. Obama said: "And when that happens, we can truly say that what is good for General Motors and all who work there is good for the United States of America."